The Fire Nation is waging a ruthless, oppressive war against the other three nations. The film's hero, the reluctant young Aang (Noah Ringer), is the "Last Airbender" -- the Avatar who, according to prophecy, has the ability to manipulate all of the elements and bring all the nations together. Aided by a protective teenage Waterbender named Katara (Nicola Peltz) and her bull-headed brother Sokka, Aang proceeds on a perilous journey to restore balance to their war-torn world. Jackson Rathbone plays Katara's brother Sokka, and Dev Patel plays Prince Zuko, prince of the Fire Nation. Mandvi is set to play the role of Commander Zhao, an ambitious and hot-tempered Fire Nation commander. Toub is cast as Uncle Iroh, the retired Fire Nation general and devoted surrogate parent to Dev Patel's character Zuko. Curtis is set to play the ruthless ruler Fire Lord Ozai. Keong Sim has been cast in the role of Earthbending Father. Download The Last Airbender in Digital HD from the iTunes store. The Last Airbender images are © Paramount Pictures. All Rights Reserved. The first film in the Last Airbender trilogy, based on the first season of the Nickelodeon cartoon series of nearly the same name, follows young Aaang (Noah Ringer), the reluctant young "Last Airbender" -- the Avatar who, according to prophecy, has the ability to manipulate all of the elements and bring all the nations together. Aided by a protective teenage Waterbender named Katara (Nicola Peltz) and her brother Sokka, Aang proceeds on a perilous journey to restore balance to their war-torn world. Not being a huge fan of director M. Night Shyamalan (The Sixth Sense, The Lady In The Water) or his oversized ego, all too often advertised in his films, I was intrigued when I first heard that he decided to write the screenplay and direct this film. Surprisingly, Shyamalan does a very good job balancing the special effects laden film while getting the story across for children as well as adults that is not "dumbed down". The screenplay closely follows the events of the three-season show of a few years ago, even having the voices of some of the animals spoken by the same people who originally brought them to life. The cast of The Last Airbender competently creates a believable world for the viewers, for the most part. Falling short of the standard set by his co-cast is Ringer, making him a poor choice for Aaang. If you are considering whether should see The Last Airbender in 3D, choose no. The Last Airbender uses the same unrealistic postproduction 3D technology as Clash of the Titans and Alice in Wonderland. 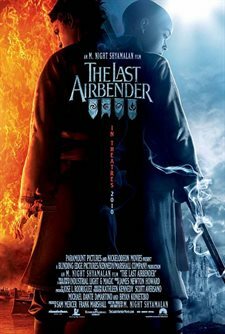 If you want to see a movie this 4th of July weekend, The Last Airbender is highly recommended. It definitely has something for everyone to enjoy. If you like it, see it twice, and hopefully it will make enough money to warrant producing the remainder of the trilogy. i like watch tu?s cool movie!!! !